EDIT: And the winner is...A Doll's House by Henrik Ibsen. I've wanted to read this for ages but put it in the 'significantly unenthused' category because I'm not sure serious women's issues is what I'm feeling right now. But, having said that, I can never refuse some lady-lovin and the opportunity to get my feminist hat on. Ibsen's Hedda Gabler is one of my favourite plays ever (non-Shakespeare), so actually I'm thinking I may enjoy this one. Here's hoping! Did you get lucky? Did you really think I wouldn't spin?! Bit late in making my list but I couldn't resist joining in after having four out of five successful spins. Will this one be a winner too? 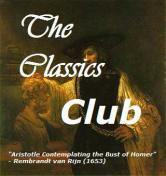 If you don't know the drill, the Classics Club explain it here. Basically, you choose twenty books from your classics list and post it on your blog. On a set day the amazing club leaders will pick a number and you have to read the corresponding book by a set date. Easy? Easy. The lucky winner will be announced tomorrow (Monday) so thankfully I don't have long to wait. The suspense usually kills me a little. If you're participating, good luck!